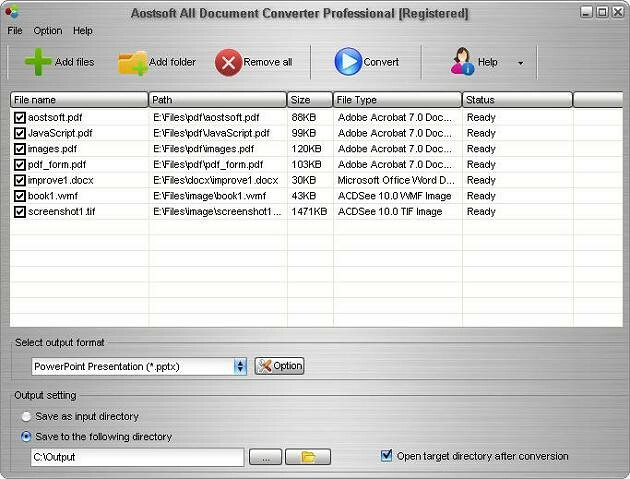 Aostsoft All Document Converter Professional is an easy-to-use and professional document conversion tool. It can batch convert office Word, PowerPoint, Excel , PDF , Text, HTML and Images with high output quality and fast conversion speed. It can supports comprehensive formats: Office Word(doc, docm, docx), Excel(xls, xlsx, xlsm), PowerPoint(ppt, pptc, pptm,pps, ppsx, ppsm), rtf, PDF, txt, html, htm, jpeg, jpg, bmp, tiff, gif, wmf, emf, psd, png, jp2, j2k etc. More setting options to let you control the output file more accurately.